Mr Gary Chan, 42, cannot remember the last time he paid the full price for a vacation. Instead, the Microsoft executive pays for flights and upgrades for himself, his partner and his parents by redeeming frequent flyer miles accrued through his travel for work and his family's spending. He and his family earn miles by paying for everything - from movie tickets to shopping to meals at restaurants - using credit cards which reward cardholders with air miles for every dollar spent, wherever they can. These miles can be redeemed for free air tickets, seat upgrades and travel privileges. "My family knows not to use cash to pay for anything. Instead, there's a hierarchy of cards that makes sure every dollar spent is focused on earning us miles," he says. Mr Rohith Murthy, managing director and co-founder of financial comparison website SingSaver.com.sg, says this kind of smart, focused spending is a great way to add value to every dollar. Some credit cards help you earn more miles when you spend on purchases locally. Others help you earn more miles when you spend online or overseas, while there are those which offer thousands of welcome and bonus miles when you sign up and spend on the card or pay the annual fee. My family knows not to use cash to pay for anything. 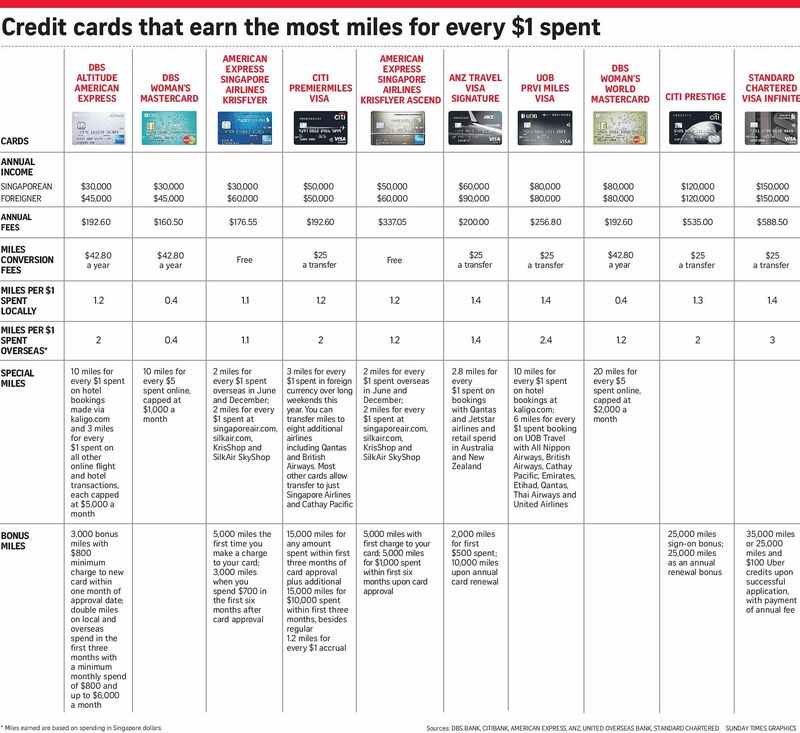 Instead, there's a hierarchy of cards that makes sure every dollar spent is focused on earning us miles. The key is finding cards which suit your spending habits and needs, he says. "Don't apply for a credit card simply because the welcome gift is attractive. Each person should look into his monthly expenditure and lifestyle and pick the card or cards with which he can optimise his spending and maximise the benefits." For instance, the ANZ Travel Visa Signature credit card, which gives cardholders 2.8 air miles for every $1 spent on bookings with Qantas and Jetstar airlines and on retail in Australia and New Zealand, is ideal for people who spend a lot of time travelling Down Under. The DBS Woman's World MasterCard is perfect for those who like to shop online - cardholders earn 20 miles for every $5 spent online. Management consultant Aaron Wong, 28, who founded The MileLion (milelion.com), a website which helps people decipher frequent-flyer and miles credit card programmes so they can "travel better for less", says the key is to have a portfolio of credit cards and to use each card according to the type of spending the card favours. "I have six or seven credit cards. I get them for the sign-on bonus miles, then cancel them before they charge the annual fee at the end of the year. That's not something you should pay unless you get something in return," he adds. Each of his credit cards is chosen according to three principles: how many miles are earned for a dollar spent; how many bonus miles are earned for signing on, for spending a certain amount within a certain time or for paying the annual fee; and conversion fees and blocks, which means how many miles you need to make a transfer and how much each transfer will cost. DBS cardholders must pay $42.80 for unlimited transfers in a year, but can make a transfer to their frequent-flyer account only when they have accrued 10,000 miles. Some cards charge $25 a transfer and the minimum miles required vary. Dr Frederick Ee, 37, has six credit cards which he uses regularly, because each has a different miles per dollar exchange, depending on the type of purchase. The general practitioner and author uses his UOB Preferred Platinum Visa Card for payWave purchases; Citi Prestige Card for general spending; Citi Rewards Card for online purchases; ANZ Travel Card to book flights and hotels and while travelling in Australia and New Zealand; UOB Visa Signature for overseas spending; DBS Altitude for general spending and promotions; and the American Express KrisFlyer Ascend for promotions and hotel vouchers. With this method, he earns close to 10,000 miles a month, which he uses to pay for flights or upgrades with Singapore Airlines two or three times a year. It costs 40,000 miles to redeem a one-way business-class seat to Tokyo and 80,000 miles for a one-way business-class ticket to destinations in Europe. Last August, Dr Ee used the miles to help pay for a trip to Bora Bora, an island in French Polynesia, cashing in 60,000 miles to redeem business-class seats from Tahiti to Auckland, then Auckland to Singapore. "A business-class flight to Auckland would have cost $4,000 or more," he says. The downside, he admits, is keeping track of all his cards. He sets reminders on his phone so he remembers to pay his bills on time and every two months, he spends half a day going over his credit card statements to make sure the miles add up. "If there is a discrepancy, I will follow up, unless it's minor. It does get tiresome, but when I think of the discounted trips, it's worth it," says the bachelor. Mr Chan has found another way. He used to have credit cards from different banks, but he cut back to two - the DBS Altitude American Express and DBS Altitude Visa - two years ago, so his family's cards and miles would be under one bankand be easier to manage. Among the four family members, the Chan family earns 15,000 to 20,000 miles a month, which is enough for them to take six vacations - about four shorter weekend trips and two longer trips - a year. Mr Murthy of SingSaver says when deciding on cards, check the fine print. "What is the expiry period for miles or the time it takes to transfer the miles, which can be weeks. When a card is offering 10 miles for every $1 spent, check for the categories of purchases or websites," he advises. Having multiple credit cards, routinely cancelling cards or not paying one's bills on time can hurt a person's credit score, he cautions. Mr Wong of The MileLion advises cardholders to set up Giro payments for each card to not incur interest. "Using credit cards is good if you are able to stay within your limits. Just because you have six or seven cards doesn't mean you have to max them out. I use the cards as I would a debit card. I'm careful not to spend more than I have," he says. When used correctly, credit cards are a boon, not a crutch. When Ms Goh Tong Huey, 37, an assistant director in a public hospital, started taking more personal and work trips overseas in January, she realised she was missing an opportunity to earn and spend miles. The cashback credit cards she had prized for their shopping vouchers were not maximised for miles. Before, she used Nets for most of her daily spending, such as dining or groceries. Since switching to the American Express KrisFlyer and ANZ Travel cards, which give her at least one mile a dollar spent, she makes more purchases with her credit cards. When travelling, she brings less cash and uses her credit cards so she can earn more miles. At the end of the month, her credit card statements indicate how many miles she has earned. "It feels good. I look right at the bottom and see the points I have. I feel I'm one step closer to redeeming a short trip, like I am moving closer to the target." In Sunday's story, "Going the extra mile for flights", an accompanying chart reflected the transfer fees for the Standard Chartered Visa Infinite credit card and Citi Prestige credit card as "free". This is incorrect. They are actually $25 per transfer. The pictures used for the DBS Altitude American Express and the Standard Chartered Visa Infinite cards were also wrong. They were, in fact, pictures of the DBS Altitude Visa and the Standard Chartered Priority Banking Visa Infinite cards, respectively.